Robberies occur every 13 seconds. It’s alarming to think about, but it’s the reality we live in. Without proper security, our homes, businesses, employees, and family are at risk. In an effort to keep you informed, our Houston security experts at Mesa Alarm Systems are dedicated to offering the advice you need to keep your loved ones and property safe. To accomplish just that, here are the top 3 places thieves like to rob the most. Gas station and corner stores are the perfect targets for burglars. Since most of them are open late, these stores are convenient in many different ways—even for thieves. 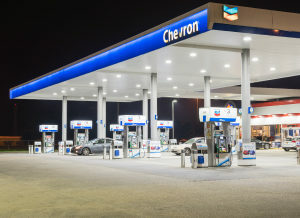 Gas station employees are often held at gunpoint and forced to fork over cash while other shoppers are frozen in horror. A little over 7,000 corner stores are robbed each year and most burglars rarely walk away with more than $900. It’s hard to believe criminals are willing to danger the lives of others for nearly a month’s worth of rent money. Since most robberies happen at night, we recommend limiting your time at these locations after dark. Jewelry stores are also highly frequented by burglars and con artists. Whether it’s done at gunpoint, stealth, or with the old switcheroo, thieves have been targeting these types of stores since the dawn of human history. Simply put, it’s an easy way to make a quick buck. Most jewelry store robberies happen when the stores open and close since those are the times when they are least crowded. Nearly 30% of the time, robbers walk through the front door and confront the jeweler. 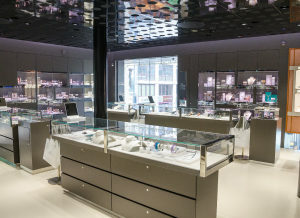 Thankfully, a lot of jewelry stores have state-of-the-art alarm systems to prevent harm to customers and losses to their valuables. Keep your business well lit. Your business should be lit as well as the parking lot and neighborhood surrounding it. This will give burglars less places to hide. It’s always best to be able to see the threat than for it to catch you by surprise. Installing security cameras the right way will give you more than security, it will give you strong evidence should you suffer through a robbery. Cameras should point at entrances, the register, and the parking lot so that you can see the thief clearly. You should also avoid the accumulation of cash within your business. Most businesses have scheduled points of cash pickup, but it is best to have a varied schedule instead. Having routine pickups can lead to burglars learning the best time to strike your business before cash is taken to the bank. Maintain your building. An unkept business, tells burglars that you don’t keep up with your business and don’t care or are aware of what happens in it. If there’s landscaping around it, trim it regularly. Buildings should be repainted if there’s weathering. This will not only keep burglars away, but will also attract more customers. Each year over 2 million home robberies are reported each year in the U.S. and almost 70% of all burglaries are residential. Needless to say, these numbers are staggering, but the most sobering statistic of all is that residents without security systems are 300% more likely to be robbed. Oddly enough, the preferred entry point for thieves is the front door followed by windows as a close second. To ensure the safety of your family and property, we highly recommend having professionals install a customized security system based on your unique needs. To ensure the safety of your family and property, we highly recommend having professionals install a customized security system based on your unique needs. Leave your home at random times. This includes walking your dog and when you go out to check your mail. Additionally, when you need to be at work or at an appointment, leave at different times. If people are never certain when you are home, most are leery to attempt a break-in. 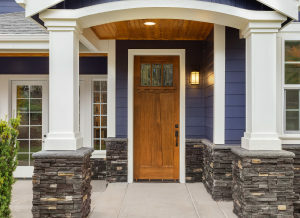 When moving into a new home, have all locks changed so that no one that has inhabited the home can come back or anyone that might have had access to keys. If you are hiring someone to do labor, complete background checks and ask for references. It is always important to know who is entering your home. 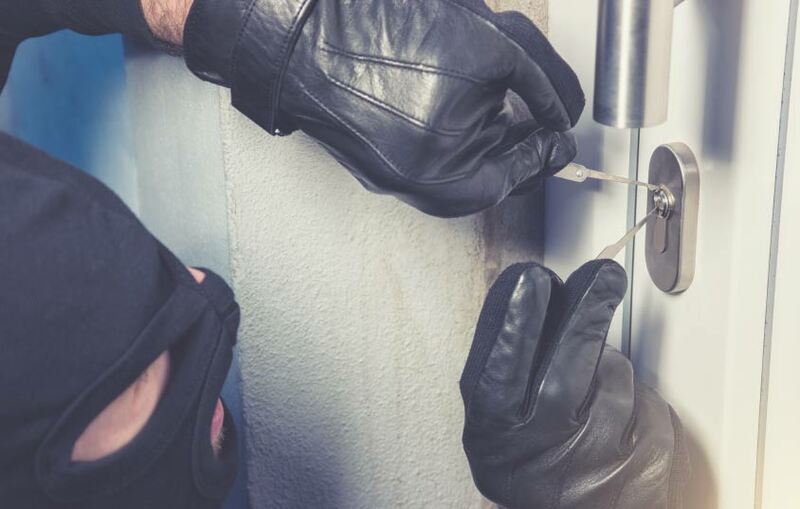 For more ways on keeping your home burglar free, read our detailed blog on how to prevent a home invasion. At Mesa Alarm Systems, we take security seriously. No matter the size of your property, our security experts are well-trained to provide the advice and customized services you need to have peace of mind. Learn more about our products and services today by calling (281) 690-4500. Don’t second guess the safety of your family and/or employees; get the best alarm systems Houston has to offer.